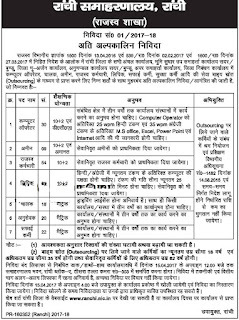 Collectorate Ranchi Recruitment Notification 2017 Has Release Vacancy For 218 Computer Operator, Clerk Post All Interest Candidates Are Required To check Official Notification Details for Collectorate Ranchi Jobs Form and Apply Offline Before Or On 15-04-2017 All Students Who Are Apply & Check Vacancy Details Like – Education And Read Official Notification, Before Applying. Also must read the official advertisement in detail before applying and job finders those who are keen and qualified they apply after getting the below section of this page of www.govtjobscare.com SHARE & LIKE. Total Post - 218 posts. Age Required - Candidates upper age limit should be between 18 to 35 Years. All Candidate will be applicable as per the rules. For Age Details Go To Detailed Advertisement. Qualification - All Interested Students should have complete 10th / 12th or its qualification Form a Required Board/University. 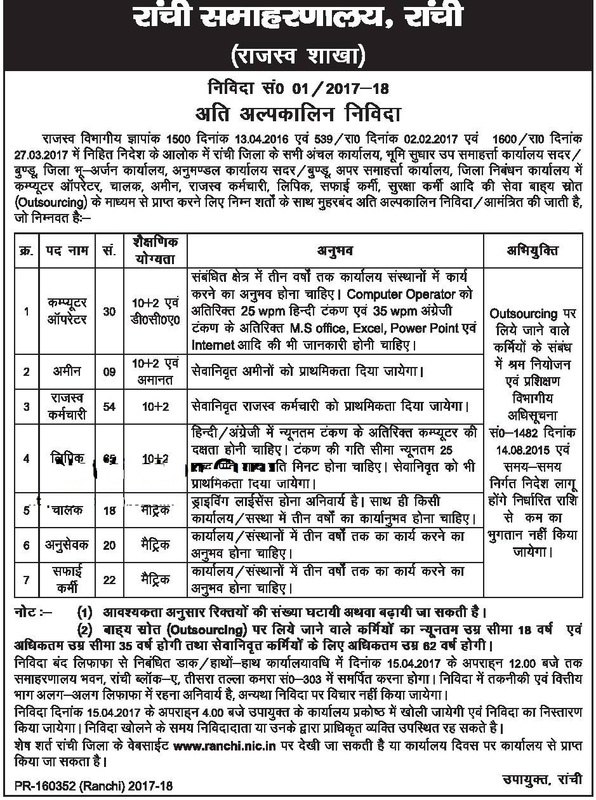 For Post Wise Qualification Go To Detailed Advertisement. Apply Form - All Students may fill the Offline their form through offline mode and also send it with all required documents Before Submit Form, Students Read Official Notification following address.Also must read the official advertisement in detail before applying.